The Great Stone, Downham, Lancashire. SD7820 4440. Embeded beneath the wall surrounding Downham Hall just by the main entrance on Chatburn road is a flat, round-shaped stone which, according to legend, marks the grave of two Roman soldiers who were killed by the Brigantes in the late 1st century AD? However, the stone originally came from the fields opposite and had lay (in situ) on or close to the Roman road to Ribchester – the course of which traverses Downham Common. Apparently the Lord of the Manor had the stone placed under his wall for protection and that’s where it has lain for a hundred years or more. If you look closely at the stone you will see tiny pea-shaped stones (pebbles) embedded into the stone, which is a type of conglomerate. In the fields nearby, lumps of agger are sometimes found – the Romans used this to build their roads. 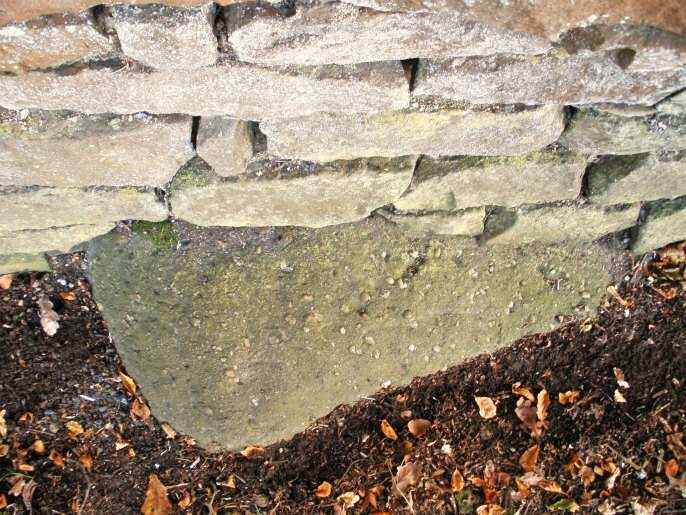 Some local historians are of the opinion that the round-shaped stone or boulder may have been the base of an ancient cross or, perhaps part of a Roman milestone. But the story that two Roman soldiers are buried beneath seems to have prevailed down the centuries, and it’s a pretty good story – so why spoil it! Categories: The Great Stone, The Great Stone at Downham in Lancashire | Tags: Roman Sites, The Great Stone at Downham in Lancashire | Permalink. Yes, that is okay as long as you credit me on your blog. Cheers.